At Daylight Systems we have installed and had experience with many other products and have seen what they have to offer. Becoming an approved installer for Solatube, the worlds leading tubular daylight manufacturer was the easiest decision we have had to make. They are sold in over 95 countries worldwide and invented the original concept. Some manufacturers boast inflated claims for the amount of light that their systems produce. Solatube invented the first tubular skylight & is the only system to hold the coveted BBA certification. The quality of components is second to none & they use 99.7% reflective tube material, the highest available. So this is why we are proud to be able to offer the brand for supply and installation. They manufacture various size options, with the smallest 160DS being ideal for bathrooms, shower rooms, en-suites, hallways and landings. It can create light up to 10 square metres coverage & is capable of tube distances up to 6 metres. The 290DS can cover up to 18 square metres and is capable of tube distances up to 9 metres in length. It is ideal for all rooms around the house and your place of work. It creates a fabulous effect in hallways and landings, with the ability to perform over two levels. Being 350mm in diameter it has the ability to fit between most ceiling rafters. Larger systems on the market can only be used in much later properties using truss roofs. So this limits their use somewhat. The 330DS although used for many commercial applications, can be used for larger rooms around the home. It will produce light coverage up to an area of 25 square metres. The wide range of attractive diffusers finish off the job in style, whereas most manufacturers have just 1 option. The quality of finish is second to none and you can choose which diffuser you would like on the day of installation. 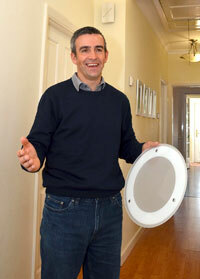 There are also accessories including internal lights, extractor fans and daylight dimmers. The Solatube brand is maintenance free and backed by a 10-year parts warranty. For further information on Solatube products please visit the Solatube website.